TORONTO (Jan. 19) — If you’re a distressed follower of the Maple Leafs, try not to worry yourself into malaise over the 3–6–0 tailspin since Dec. 29. Or, the 1–5–0 recession on home ice. For a couple of important reasons: 1) a sage once explained to me — with infinite rationale — that worrying about something will never prevent it from happening. And, 2) your team may be heading toward an impeccable spot. Seriously. The evidence after 47 games indicates the Leafs, as currently constituted, must avoid another first–round playoff clash with Boston. That could change if Kyle Dubas adds some mettle to the roster before the Feb. 25 National Hockey League trade deadline. Otherwise, the Leafs are likely too placid to prevail in a seven–game showdown against their Division nemesis. So, evading second or third place in the Atlantic would seem to be ideal for the Blue and White. Even the No. 1 Wild Card position in the Eastern Conference is troublesome, for it begets an opening–round date with one of Washington, the New York Islanders or Columbus, all of which compare favorably to Toronto. Conversely, the No. 2 Wild Card spot guarantees a quarterfinal engagement with the Tampa Bay Lightning. And, the Maple Leafs have played, arguably, their two best games of the schedule, thus far, at Amalie Arena against the runaway No. 1 team in the overall standings. Of course, it’s imperative for Toronto to put the brakes to this nosedive in the foreseeable future. Otherwise, the club will drop out of playoff territory altogether. As of today, the Maple Leafs (29–16–2 for 60 points) are second in the Atlantic, one point up on third–place Boston and fourth–place Montreal; the latter holding down Wild Card–1 in the East. Wild Card–2 belongs to the surging Pittsburgh Penguins (7–3–0 in the past 10), two points behind Toronto. Beyond the playoffs, at the moment, is Buffalo, with 54 points. And, barring the unexpected, no other Eastern club has a reasonable chance of qualifying for the Stanley Cup tournament (10th–place Carolina is five points in back of the Sabres). Wild Card–2 could theoretically belong to the Maple Leafs by the end of the weekend — requiring Montreal to beat Philadelphia this evening at the Bell Centre; Pittsburgh to prevail in Las Vegas later tonight… and Toronto to lose (egad!!) to Arizona at Scotiabank Arena on Sunday. A victory by Boston (at home this evening to the Rangers) would also “help” the Maple Leafs. You could be sensing a bit of tongue–in–cheek here… and there is some. But, not much. The Leafs and Lightning are similar — with abundant creativity, good scorers and front–line goalkeeping. Tampa’s edge is obvious: 6–foot–6, 223–pound Victor Hedman, the reigning Norris Trophy recipient. Though Morgan Rielly is out–pointing Hedman this season (48–31), the Leafs have no size–answer on defense for the big Swede. Up front, Nikita Kucherov (leading the NHL with 72 points) and Brayden Point (30 goals, 63 points) are among the best players in hockey. Still, the Leafs match up way better against T–Bay than Boston. And, Toronto’s only hope of a first–round playoff quarrel with the Lightning is Wild Card–2 in the Eastern Conference. 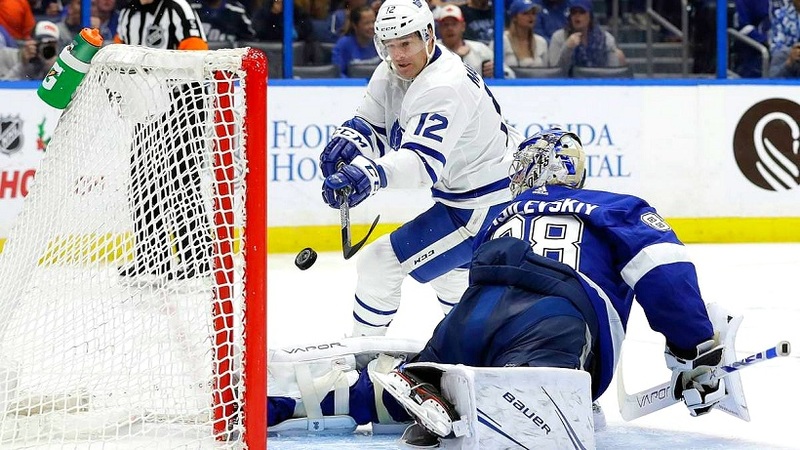 ON THE FLIP SIDE… Sandwiched around the impressive win at Tampa on Thursday were appalling performances against the Colorado Avalanche and Florida Panthers — a combined 3–16–5 heading into their games with Toronto. The Avs (winning 4–2 at Scotiabank Arena on Monday) were 3–10–3 in their prior 16 matches while Florida broke a nine–game losing streak with a 3–1 victory on Friday night at the BB&T Center in Sunrise. Rarely have the Maple Leafs looked as blase and indifferent as during the humiliating losses. Something has gone amiss for the Blue and White to this point in 2019. The groin injury sustained by Frederik Andersen didn’t help… but there is no plausible answer for the regression of Auston Matthews, who last scored two weeks ago tonight against Vancouver — his lone tally in the past 12 games. Prior to the slump, Matthews was scoring at a pace (over 82 games) that would threaten Wayne Gretzky’s NHL mark from 1981–82 of 92 goals in a season. Suddenly, Auston has gone colder than at any stage in his brief career with Toronto. William Nylander, on a similar note, has earned a spot in the press box. There is absolutely no excuse for his one goal, three points and minus–9 in 19 games since re–joining the Leafs, Dec. 4, at Buffalo. If you watch Nylander, he is either lazy, confused… or both. Mike Babcock, in a feeble attempt at motivation, has dropped young Willie to the fourth line, alongside Frederik Gauthier and Par Lindholm (a combined three goals and 18 points). 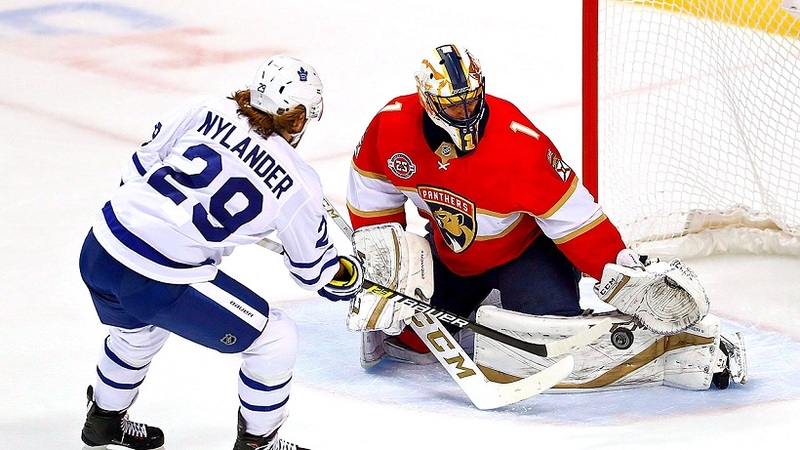 How that scheme could possibly benefit Nylander is well–beyond comprehension. Perhaps a night or two watching from above may awaken the Swedish forward. At the moment, however, the NHL’s highest–paid coach is furiously re–arranging deck–chairs on the Titanic… with similar results. If Matthews and Nylander remain routinely absent from the score–sheet, the Maple Leafs have little chance for anything beyond a Wild Card spot in the Eastern Conference. STILL UNCONVINCED?… Among the multitudes that wanted me committed to an insane asylum when I suggested, last week, the Maple Leafs trade Nylander to Philadelphia for Wayne Simmonds, none have come forth with a persuasive argument. Yes, Willie is eight years younger. 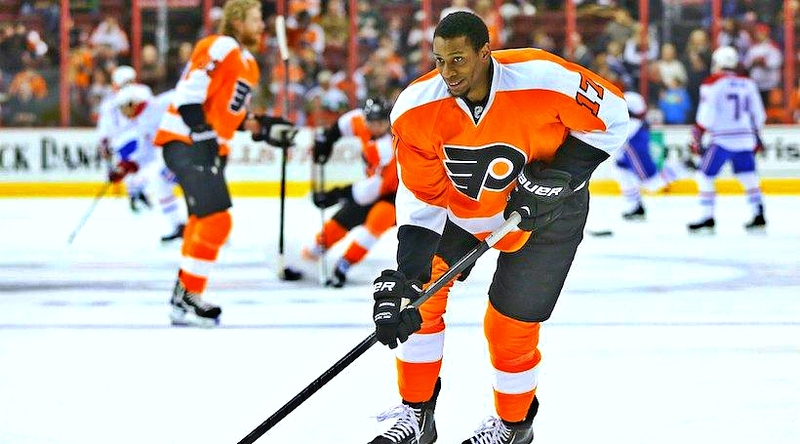 And, yes, Simmonds can become an unrestricted free agent in July. Please forward any other news bulletin. If, however, the Leafs are built to win now, in what way could such a deal hinder the club? Simmonds would surely provide Toronto some much–needed size and sandpaper up front for the arduous playoff path in the Atlantic Division (the Leafs maybe having to defeat Boston and Tampa Bay to become a Stanley Cup semi–finalist). It is also reasonable to assume that Simmonds would happily agree to a new contract with his home–town team. Also, there is virtually no downside, in the foreseeable future, to trading Nylander’s six–year, $41.8–million contract, which consumes nearly $7 million in salary–cap space. The Leafs will be in a precarious cap–crunch before next season — Matthews, Mitch Marner, Kasperi Kapanen and Jake Gardiner among those needing to be re–signed or adequately replaced; the club is not shy on skill up front, even without Nylander, and — at 30 — Simmonds wouldn’t likely command more than $5.5 million a year in cap room. So, again, even if Nylander were to score 80 goals for Philadelphia three years from now, how would this transaction preclude Toronto from getting better… right now. Awaiting more replies, behind your blue–tinted–glasses. Nylander would be much better utilized as part of a trade for a desperately needed top two defender with term left on their contract. At 30, Simmonds’ best years are behind him and the Leafs’ window is just opening. So not a good match age-wise. Bottom line, he’s a luxury the Leafs can’t afford given their obvious needs on defence. Use Nylander to help address the most pressing need.